Hello lovelies! I have a number of new releases from Girly Bits to share! Because they're not all part of one collection, and there's a lot of info to go along with them, I'm splitting them up into two posts. Part 1 features the two Color of the Month shades for June and three shades that will be launching at Indie Expo Canada coming up this weekend. Make sure to read the end of this post if you want to know how to get your hands on these beauties! What A Bunch Abalone is a shimmery mint green holo base with a strong pink flecked shimmer and teeny teal flakes. The application was nice and smooth. There's so much subtle shifting going on here! Shown is two coats plus top coat. 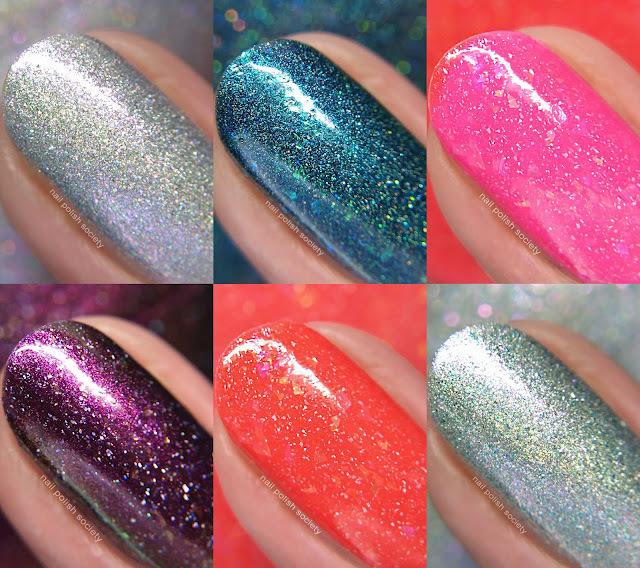 Shell Yeah is a shimmery silver holo base with a pink flecked shimmer. This is the sister shade to What A Bunch Abalone, with this one leaning more silver. The formula is the same as above. Shown is two coats plus top coat. North of 42 (IEC 2018) is a teal green base with a slight violet to gold shift, holo sparkle, and various sized green to blue shifting iridescent flakes. I like how different this shade appears in different lighting. The flakies can really shine through and make it almost vibrant green. Shown is two coats plus top coat. Zed (IEC 2018) is a magenta to copper to green multichrome that shows purple and blue at the edges, with holo flakes, and green to yellow iridescent flakes. Another nice and smooth formula. You know I'm not great at capturing multichromes, but the second photos shows it off best. Shown is two coats plus top coat. The FoMo is Real (IEC 2018) is a bright orange to pink thermal with iridescent shifting flakes in gold, purple, pink, and green, and with holo flakes. My oh my oh my. This bright thermal looks gorgeous either warm or cold! I love the delicious sherbet colors! Shown is two coats plus top coat. The online retail price of the three IEC shades will be $16.50 CAD, with a discounted price of $15.50 at Indie Expo Canada and Polish Con. These are all limited edition and will be available for purchase online starting in July. Because of the instability of the thermal elements, The FoMo is Real may not be available after the Expo until Fall.